At the age of 77, Leonard Cohen’s refined philosophical lyricism and insight into life is maturing like a fine wine, resulting in his new album, Old Ideas, being one of his best. Themes like love, loss, spirituality, suffering, and healing saturate the songs much like Cohen’s earlier work, but this album also has a pronounced focus on servitude, forgiveness, and mortality. Cohen’s thoughts on life and mortality are the heart of the album and while they have an ethereal tone that seems to imply that he sees himself more of a vehicle than a prophet and one of the strongest examples on the album is the poem-turned-song “Going Home,” which is quintessential Cohen. While his songs on mortality might be the most notable, it doesn’t undermine his love songs, which might be the most effecting and eternal. There is something refreshingly relatable in songs like “Crazy To Love You” and “Anyhow,” in which Cohen states “You never ever loved me, but could you love me anyway?” which might be as lasting as anything he’s written. The music on the album is beautiful as well, although there are a few missteps such as “Come Healing,” which is a gorgeous song, but one which pits his deep baritone awkwardly against the angelic siren tones of his backup singers, The Webb Sisters. But it is an exception as the soft, smooth backup voices tend to complement his voice. 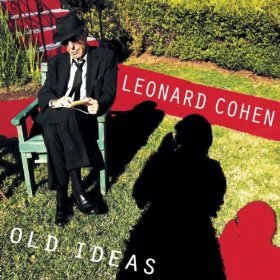 Old Ideas represents all the refinement and craft Leonard Cohen has developed over the years and it’s greatest strength might be in it’s enlightened simplicity.